Review of the Bradford White tankless water heaters for home use. Find out how on-demand water heating and condensing technology can bring you great benefits and savings. 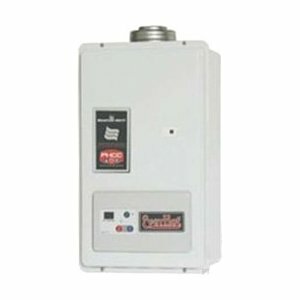 Bradford White, a manufacturer of the best-rated water heaters in North America, offers high performing tankless water heaters for residential and commercial use, and are grouped in two categories; mid-efficient as non-condensing and ultra-efficient models with the condensing technology. Bradford White on-demand heaters are known as Infinity series and are consisted of indoor and outdoor models using natural or propane gas. Bradford White tankless waters operate with no water storage tank but using the tankless technology and small heat exchanger (one or two), which allows space heating and water heating on demand and hot water delivery in endless supply. More about gas tankless heaters you can find it here. The non-condensing model comes with the energy efficiency of 0.83 which allows it to provide an efficient operation with the reduced energy consumption and decent energy savings. There are also ultra-efficient models with the energy factor of 0.95, also known as condensing water heaters, and they come with the significantly lower heat losses/greater savings than non-condensing. This is what makes them Energy Star compliant and eligible for additional savings through the rebates and incentives. Tankless heaters, thanks to its advanced design operate with the lower greenhouse gas emission, which makes the tankless units environment-friendly or "green." Modulating gas valve allows Infinity heaters to work within the power range from 19,900 to 199,000 BTU, so when the water flow changes, the heater adjusts its power to provide hot water with less temperature fluctuation and as accurate as possible to the set temperature. Digital controller gives you an option to control and monitor hot water temperature, which goes from 96 F to 140 F in residential applications or if used in commercial applications and with the separate controller, from 96 F to higher 185 F. The controller is built-in into the front panel of the interior models, while exterior models are shipped with the primary remote controller. The controller also makes the troubleshooting easier as it notifies the user about the malfunction and through the error codes such as A2, A3, C7, E1, E2, ... about the problem. Even without the storage tank, Bradford White tankless water heaters are prone to lime and sediment build-up, but the SRT or Scale Reduction Technology helps in reducing the problem and keeping the performance high. The heat exchanger, which is made of the corrosion resistant copper, and with the installed turbulators and even heat distribution from the vertical burner design, ensures quick heat transfer, efficient water heating and reduced occurrence of the mineral build-up. Condensing model utilizes two heat exchangers; primary - made of copper as the non-condensing group, and secondary - made of aluminum as the lighter version, but still resistant to the stress. Models are intended for variable flow applications and the maximum water flow at 45 F temperature rise can reach 7.3 GPM for RTG-199ME model and 8.3 GPM for RTG-199HE model. If the cascade feature is used, hot water delivery can be significantly higher, because the cascade feature allows the combination of up to 24 units into one system. Temperature stability has been achieved by using the automatic bypass system which is found on RTG-199HE unit or water adjustment valve utilized by the non-condensing RTG-199ME model. Interior gas tankless models must vent the flue gases out and take the fresh combustion air in. This is done by using the power venting system with the twin-pipe or concentric termination, which runs horizontally through the walls or vertically through the roof. The outdoor units do not require venting system but the outdoor kit. The main differences between these two groups are that condensing water heater is ultra-high efficient (higher energy efficiency), has a higher water flow, includes two heat exchangers, is Energy Star compliant, comes with the more flexibility in venting system, the size is the same but is heavier. Due to its compact design, Bradford White tankless water heaters can easily mount in tight spaces and on the wall, saving you the floor space for other use. As most of the tankless heaters, they are reliable and durable, which allows Bradford White manufacturer to offer a 12-year warranty on the heat exchanger and five on component parts.